Welcome to the FPBioimage project page. FPBioimage is a volumetric visualization tool which runs in all modern web browsers. Try the tool yourself at our example site here. If you use FPBioimage to share your data, please cite our original publication in Nature Photonics. FPBioimage is easy to use by clicking and dragging with the mouse. To utilize its more advanced features, watch the instructional video below. To use FPBioimage for sharing your own data, watch the video below or follow the sharing guide. FPBioimage is open source. The software was developed in Unity to ensure cross-platform compatibility. A free Unity license is now available to academic institutions. To contribute to FPBioimage, fork our git repository. This contains the Unity assets required to build the tool from scratch. If you have found a bug, please report an issue. 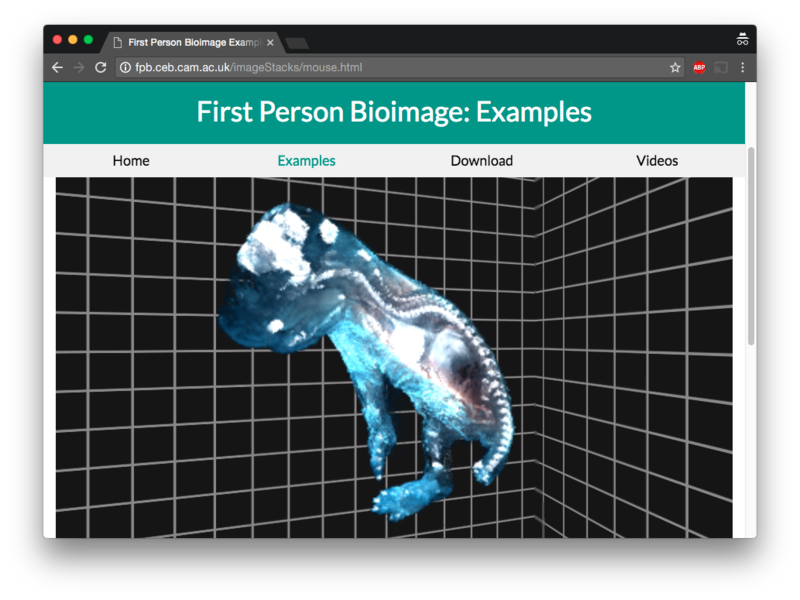 First Person Bioimage (FPBioimage) is distributed under the Creative Commons Attribution - ShareAlike 4.0 International license. This means that, providing you credit the original software appropriately, you are free to copy, redistribute, remix, transform and build upon the software, as long as future contributions are distributed under the same license. If you use FPBioimage to publish work in an academic journal, please citation the original publication of the software in Nature Photonics.